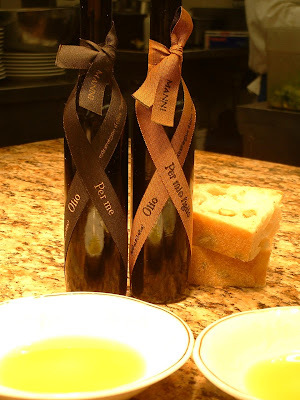 A good friend; owner/chef of the ever popular hip eatery on the peak heading into Madison Valley; CRUSH...hooked me up with some tres bien olive oil the other day. It is called Manni Extra Virgin Olive Oil Toscano, by Armando Manni. It is a truly unique and lively pressing of organic, hand picked and cold pressed olives from the 2006 harvest. It is produced in Seggiano, Italy, from high up in the mountains and bottled in Montepescali; Scalo. This oil is produced within a scientific research project in collaboration with the department of Pharmaceutical Science at the University of Florence which has brought it to a truly amazing level. It comes in small 100ml. 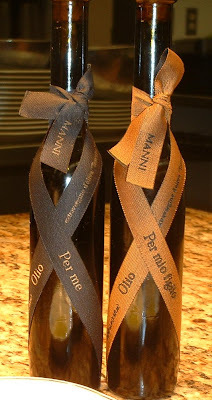 bottles, which are divided into two varieties..."per me"(for me) and "per mio figlio"(for my child). The latter being a bit lighter in weight and nature, yet yielding a nice, fruity blend with a slight kick of pepperiness on the back. Grassy and floral notes are evident with just a kiss of acid. 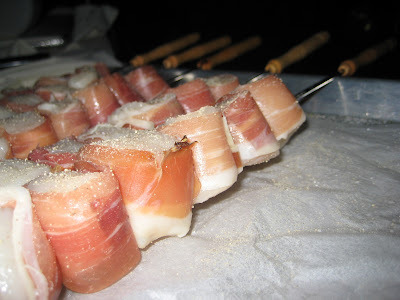 Perfect for many different occasions and usages and food pairings or simply dipping. The former; Per Me, is a bolder, bigger oil with a good amount of body to it, peppery edge and wonderful true olive taste bitterness. This is a good bitterness as it makes for a very intriguing taste and texture. It makes you think. It makes you take notice. It is good for you. You really taste the olives and the natural fruitiness with much character and slightly provocative acidity. This one is probably not for everyone or every occasion, as it could overpower some of the delicate dishes and flavors elsewhere, but the true, fresh flavor of the olives are sure to be a great addition. Armando apparently does not sell to just anyone. Crush is the only person in town(Seattle) that I believe has it. I have small stash, but only for personal use. With only a bit of contraband and paraphernalia at my disposal, I keep it discreet and on the down-low. These oils can be found in numerous other world-class kitchens such as Per Se and the French Laundry, Le Crillon, Alex, Daniel, the Fat Duck, Little Nell, Tetsuya's and others. Hopefully, the club will be soon on the list! I am always on the lookout for new, artisan products that are awesome and flying under the radar, or at least trying to. Check it out if you can find it! 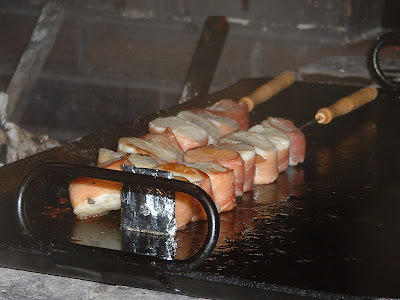 To Baste or to Baste?...is there any other question? Saddle of Lamb "en Crepinette"
Perhaps this post should have been dubbed as "In the Name of Burning Beast", or "Take Hold of the Flame" or some damn thing. Any way you choose to singe it up, the song remains the same! This is about our artistry and craft prepared in a different light~ the light of the fire and the heat of the flame and coals. 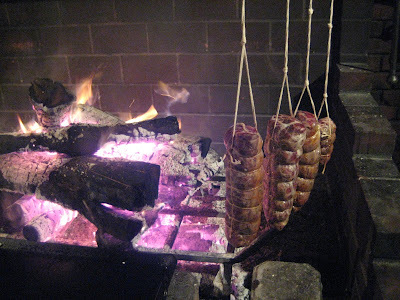 From time to time, we prepare a feast a'la fuego; or "cooked in the fireplace"; literally. 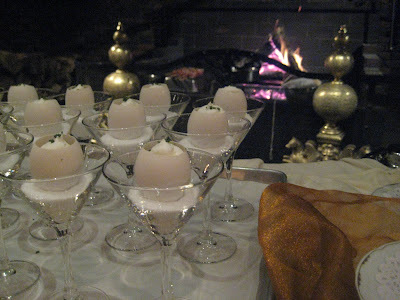 All courses are cooked entirely over a roaring 800-1000 degree fire, then carved and presented in front of our guests. 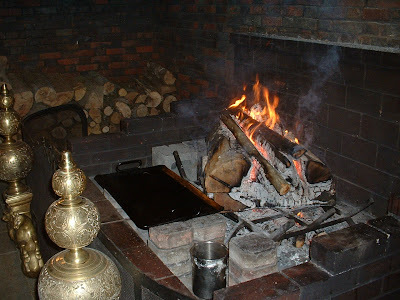 Our "kitchen", is a gigantic "old world" fireplace that one could park an SUV in, and sets the stage for a serious medieval moment in rustic and kind of barbaric cookery. From hearth roasted pheasant to charcoal smoked sea bass, skillet cooked cornbread to ember kissed whole lobes of foie gras, plancha seared scallops to spit roasted baby goats, from barbecued lobster brochettes to smoked chocolate s'mores...the essence of survival and primitive thoughts runs ramped while the passion for creating new experiences for our guests is fueled by the flame! 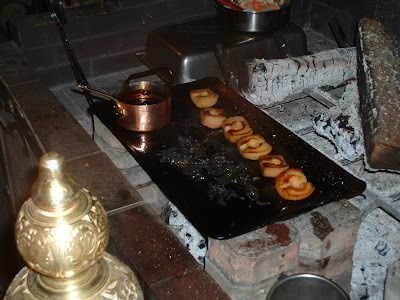 We have been the culinary keepers of the fire on numerous occasions and our most recent charge of tending to the burning beast was a special, up close and personal dinner with the Governor, as well as many high profile guests. No politics, (well, not much anyway) no real agenda, no serious business, just good friends, good food, a cool setting and sheer intimacy. Good times! 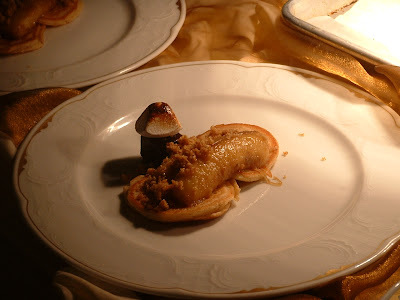 Although the menu for this fireside soiree was not as in depth and avant garde as past contemporary cookouts,(this was due to time constraints and personal desires of client) it was awesome! There is simply nothing like it at all in the whole city that I am aware of. It is complete uniqueness. Here is a peek of the embers as they lie.